ANGLER's expertise on Microsoft Office SharePoint Server have made us to deploy several MOSS products which are effectively scalable, highly reliable and have a speedy turnaround time. ANGLER has a great experience in developing custom solutions for Microsoft SharePoint Software Development. We can help you leverage Microsoft SharePoint in a perfectly-tailored strategic way. 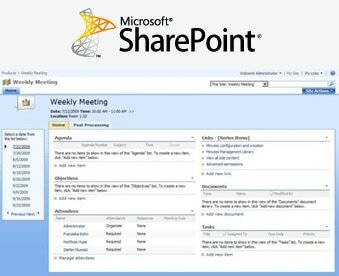 ANGLER’s Microsoft SharePoint Solutions allow you to get control of your SharePoint environment. Our experienced SharePoint Developers can deploy SharePoint, customize it for your exact needs and create custom modules which are not included in original installation for your specific tasks. ANGLER offers Offshore Development Center (ODC) services including Crystal Reports Software Development to customers worldwide in India, UK, USA, Dubai, Singapore, Canada, Hong Kong, Germany, and The Netherlands & South Africa. We at ANGLER Technologies have expertise in SharePoint consulting, development and support for Windows SharePoint Services, SharePoint Portal Server, and SharePoint Server 2007 (MOSS 2007). Our SharePoint team provides custom development using SharePoint Server and delivered fascinating solutions to our customers. Contact us today to know more about our SharePoint software development services or to hire our SharePoint developers for your needs.